This is a die-cut White King Soap porcelain sign. This particular White King Soap is shaped and colored like a box of White King Washing Machine Soap. 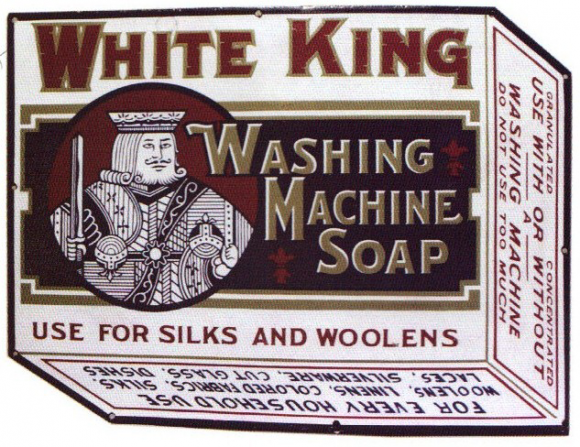 It reads, “White King Washing Machine Soap, Use For Silks And Woolens, Granulated, Concentrated, Use With Or Without A Washing Machine, Do Not Use Too Much, For Every Household Use, Woolens, Linens, Colored Fabrics, Silks, Laces, Silverware, Cut Glass, Dishes” in black and red text and features a white playing card king on the left side of the sign.